So who else was wondering what Mr Cooke meant by Lapsley and Queen? Wonder no longer, frustrated toile-makers and cuff-detail mavens, it is available on the vast interwebs of knowledge. Go! 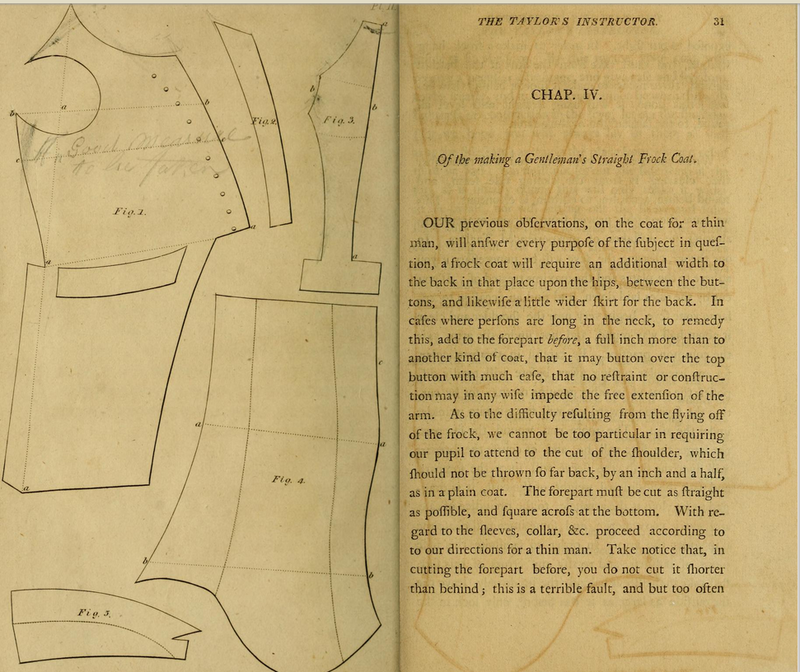 Download the PDF and immerse yourself in an 1809 American tailors’ manual published in Philadelphia, with Eight Appropriate Engravings. We may note that there was excited squeaking when I located this, altering my nearest companions to A FIND, and letting them know that yes, I am back, and probably will continue to squeak on and off for some time to come. I can tell from the text on Coats that my subjects will have to be further apprehended and measured, even against their will, but the results will undoubtedly be better than before. Happy Reading, Historical Sewing Enthusiasts, and a big thank you and hat tip to Henry Cooke for the reference. 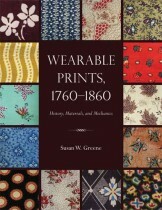 This just in, literally, from the mail carrier: Susan W. Greene’s long-awaited book, Wearable Prints, 1760-1860. It’s discounted (and out of stock) at Amazon, but should be shipping soon, since I have one right here on my desk. The book is organized in three main sections: Overview, Colors, and Mechanics. Appendices include timelines, prohibitions, price comparisons, print characteristics, and more, as well as a glossary and an extensive bibliography. The photographs are amazing, and show a range of print designs of greater variety than we may have credited heretofore. Particularly useful is the section on evaluating and identifying printed dress fabrics, and the questions one should ask about fabrics. I think that the criteria could be used forensically on modern as well as historic textiles, and we could think more critically about the fabrics we use. ETA: I wrote this while the downstairs room was being painted with oil paint, and it’s loopier than I expected. The book is still an excellent resource, and I highly recommend it. While it’s heavy for carrying to the fabric shops, it would be dead useful while shopping online. I have definitely seen bolts of fabrics very similar to those illustrated in Greene’s book. As Anna notes on her blog, Ms Greene’s collection is now at Genessee Country Village. Wow. It’s amazing. If you can’t get there easily, well, the book will certainly help, and the images will you visual access to a plethora of collections. Last night, I went to a meeting downtown for my boss, and chose to walk instead of drive. I took some blurry photos along the way as evening became night and the city became more and more like Busy Town. The skill level of local drivers is not too different from Richard Scarry’s drivers…and the hills and the way the houses stack up, and the way we recognize or know each other here reminds me of Scarry’s books. The text could have been edited a little more carefully and I am a fan of the endnote (not present here). But there are excellent photos I have not seen before and diagrams patterning garments. Now you see why I bought this: where else will I find diagrams of aTeddy Boy Jacket and a 1960s Bellville Sassoon-inspired evening dress?